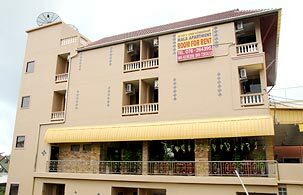 Mala Apartment is offering 18 standard rooms which are clean and newly completed. Have a safe and secure stay in our apartment among lively tourist community with 24-hour CCTV system and key card access. Surrounded by many restaurants, shops and other services, Mala Apartment is another accommodation on convenient location with an easy access to Kata beach. Rooms are fully equipped with amenities and facilities to allow an easy day and night. Services for both monthly and daily rental.